A week before the celebration of the Jewish Passover, Jerusalem must have been a bustling place crowded by pilgrims, traders, residents, and soldiers, all focused on preparing for this festival. And in this busy scene Jesus makes his entrance stopping everyone in their tracks, forcing everyone to acknowledge his presence. Recently someone experiencing a lot of troubles reminded me of John Lennon’s words, ‘Life is what happens while you are busy making other plans’ and this is what we see this in our first gospel reading. In the middle of the frenetic preparation for Passover, as the people are busy planning and organizing for other things, life throws at them something unexpected and unprecedented; Jesus – who is described in John’s gospel as that life which is the light of all people (Cf. John 1:4) – enters the holy city with a charismatic presence that cannot be brushed aside or ignored. ‘Life is what happens while you are busy making other plans’. Life, the life of Jesus, happened to the people of Jerusalem then (it was real, tangible, there…) but it can happen to us all well this week. How? If we truly engage with Jesus this week, as we relive (not re-enact) his passion, death, and resurrection then his life will also happen to us. A week before Easter Day our domestic lives are probably focused on preparing for the secular aspects of Easter; children breaking from school, relatives to get in touch with, meals and Easter eggs that we must account for… but among all this business the life of Jesus can happen to us as well, bringing with it renewed faith, and reaffirmed confidence. But what do I mean by letting the life of Jesus, happen to us this week? Today we enter in the most important week of the Christian year, and as we do so we physically enter into church bearing palms as if we were entering Jerusalem on the first Palm Sunday. But this is not historical re-enactment. We walk with Jesus, we acknowledge him to be the one coming from God, we pledge to stay with him this week regardless of the other things that we may want to do. In the same way this week we will relive other key moments of Jesus life – making them present, letting them happen to us. So, this holy week let us make an effort and let us give the opportunity for Jesus to speak to us through our many liturgies. 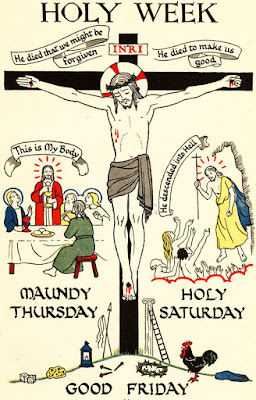 Only if we do this, only if we let the life of Jesus happen to us and disrupt all the other things we would like to do, we will be able to reach Easter Day with the confidence to renew our Baptismal commitments to the faith and to Christian way of life. It's a painful walk each time we follow Jesus through Holy Week but only by walking that way can we really experience the joy of Easter.